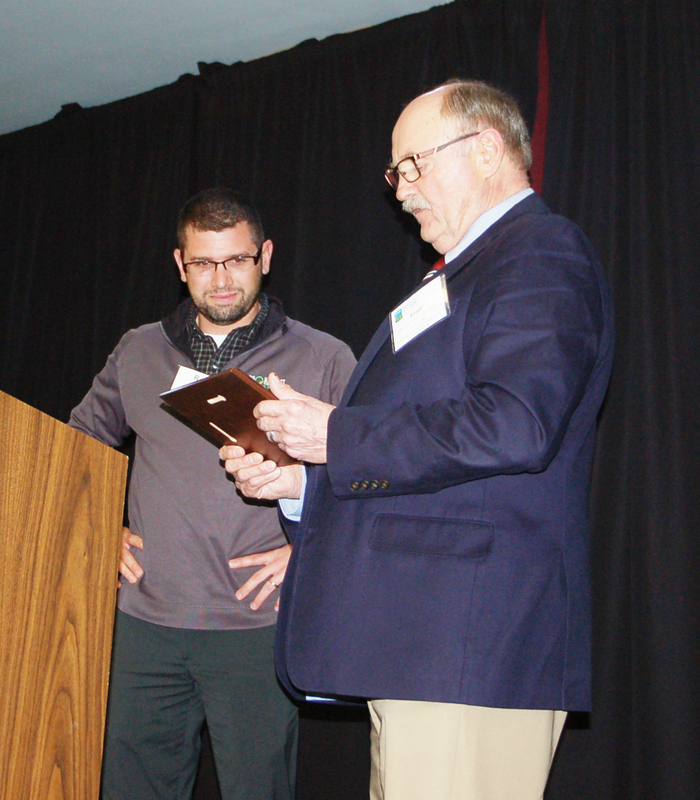 First MidAg Services’ Ross Albert, AFM, Bloomington office, looks on as Ernest Moody, AFM, ARA, AAC, reads the inscription on the “Workhorse Award” presented to him at the annual meeting of the Illinois Society of Professional Farm Managers and Rural Appraisers. The plaque reads “This Workhorse Award is presented to Ross Albert, AFM, for his continuing commitment to providing information to the public and promoting the mission of ISPFMRA through his leadership as Chair of the Public Relations Committee. Your work is truly appreciated. Presented February 7, 2019.” The leadership of the Chapter asked Moody, former PR Committee chair, to make the presentation on behalf of the entire membership. Moody cited Albert’s work at authoring and directing writers in a series of monthly columns that appear in Prairie Farmer magazine with the focus being on advice from and the advantages of seeking the counsel of professional farm managers and rural appraisers.